In 1954, James McLamore and David Edgerton opened their first Burger King restaurant. Three years later the Original “Whopper” sandwich was born. The founders’ vision of providing “quality food, served quickly, at a reasonable price” became a pioneering business model that helped shape the fast-food industry. As Burger King rose in popularity, restaurants began to open across the United States. In 1963, Burger King opened its first international restaurant in Puerto Rico. In 1975, drive-thru service began, and by 1977, Burger King had opened 2,000 restaurants on three continents. Today, the Burger King system operates more than 11,300 restaurants in 50 states and 69 countries. Approximately 90 percent of Burger King Restaurants are owned and operated by independent franchisees. Burger King has more than 11,000 restaurants globally in more than 60 countries. This impressive growth relies on the success of their franchisees, and that is why Burger King’s market plan focuses on “restaurant-level economics.” Burger King continues to create franchise opportunities around the globe in both new key markets where other Burger King restaurants have already proven themselves. To appeal to a broader customer base, Burger King offers a variety of food options, such as a full line of breakfast products, salads, BK VEGGIE® burgers, desserts and more. To stay competitive, they continue to develop new products. Franchise Fees is a flat $50,000, and the total investment could be as low as $300,000 making Burger King a much more affordable option than most in its class. Burger King’s franchisee training is geared to provide you with the skills to help build a successful business in this extremely competitive marketplace. Burger King offers over 70 days of initial training that covers a broad range of technical and managerial skills. Courses can be added later for you and your team to increase experience, business, and operations knowledge. General business knowledge and past food service experience are required. You can have it your way, and you can probably afford it. Here is a super chain franchise you can really sink your teeth into. There is absolutely NO feeling of exclusivity here; in fact, Burger King is downright friendly when it comes to getting you into a franchise. This 45-year-old global brand is truly in touch with the franchise experience. Of all the leading high dollar franchises, we like Burger King the best. The site is user-friendly, helpful and does not have that “restricted/elite” feeling, and according to Entrepreneur Magazine, Burger King is still in the top 28 fastest growing franchises. Franchise Fees - Lower than normal franchise fees. Burger King earns 4.5 percent royalties on sales as opposed to the more traditional 6%. Affordable - This is the least expensive of the super chains, and although it can still run into the high 6-figures, friendly Burger King makes you at least feel like you can afford it. Special Incentive Programs - MinorityFran Participant, and unsurpassed on-going support. None - We couldn't find much wrong with this one. 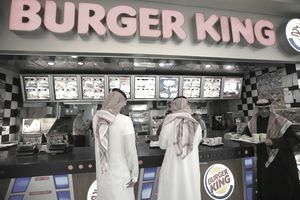 Although Burger King is not a consumer's first fast-food choice, excellent market research and hand-holding by the company ensures profitable sites before start-up.